Conrad Forest Products is a leading producer of Douglas Fir Railroad Crossties and Switchties treated with Chemonite® ACZA Treatment. Chemonite® crossties meet the requirements of AREMA, and are now available with borate additive for deeper protection. For prices and other order details, contact us at 800-356-7146 or via Email. These attributes, plus advantageous environmental and handling features, make ACZA-treated Douglas fir an exceptional choice for shortline crossties. They are also economical; Douglas fir is a readily available species grown on managed timberlands in western states. Development of the original copper arsenate solution began in the 1920s. The current formulation, ACZA, was accepted in the standards of the American Wood Protection Association in 1984. A quarter-century of successful use attests to the effectiveness of ACZA-treated wood. Crossties and switchties are listed in AWPA Standard U1, Commodity Specific C, as appropriate uses for ACZA treatment (Use Category UC4A at 0.40 pcf). Tests have also shown that the treatment reduces flame spread. The strength of crossties is not perceptibly affected by the treatment. Years of use under extreme conditions have revealed no structural failures due to corroded hardware. However, in some designs and environmental conditions, the use of hot-dipped galvanized or stainless steel hardware is recommended. Douglas fir has excellent spike-holding characteristics which are not diminished by the preservative chemical or the treating process. Tests have indicated that the metallic oxides in ACZA are not conductive. Regardless of the test method used, a bigger factor than wood species or preservative was moisture, which affects all types of treated wood crossties. Douglas fir ties were installed in the High Tonnage Loop of the Transportation Technology Center's Facility for Accelerated Service Testing. These ties remained in service for more than 1,000 Million Gross Tons of freight traffic. Regaging was not necessary until approximately the 200 MGT mark. Handling Chemonite crossties does not necessitate unusual safety measures beyond those recommended for most other construction materials. These include: Wear gloves when handling, wear safety glasses and dust mask when drilling or sawing, and do not burn treated wood. State and local requirements vary, but, in general, lined landfills accept retired Chemonite crossties and scraps in accordance with the same requirements that apply to other building materials. Where questions exist, confirmati on from the appropriate local authority is recommended. Chemonite crossties share the many environmental attributes of wood itself — most notably: renewable resource, low-energy production, and carbon sequestration. The preservative process adds to these benefits by extending service life, thereby reducing demands on forests and transportation of replacement material. Furthermore, ACZA bonds chemically to wood cells as insoluble precipitates, becoming very leach-resistant. The wood surface is non-oily and clean-to-the-touch, even in high temperatures or salt water. More info about Arch® H2O Water Block . Douglas fir crossties, dual-treated with ACZA and borates, are an option. Like ACZA, borates have a long history of effective decay prevention. They have been used for decades to protect sill plate, and have supplemented other preservatives in protecting hard-to-treat species of wood. The borates diffuse deep into these species, as confirmed by tests on hardwoods at Mississippi State University. The result is protection of inner areas that might otherwise be vulnerable to decay when exposed by cracks or wear. Borates also inhibit corrosion, enabling spikes to maintain their integrity for a longer period of time and thus hold gage longer. Treatment with borate additive is available from Conrad Forest Products. In addition to the borate additive, crossties can be ordered in custom sizes, with special milling, with plated ends, and coated with silicone sealer (Anti Blu® H20 Water Block). In 1983 a complete data package was submitted to AWPA and approved to support the use of ACZA as a wood preservative. As the preservative system has expanded its ability to protect wood products especially hardwood ties, Updated evaluation for the typical parameters required of new wood preservative treated wood products as well as evaluation of some particular properties of this preservative system have been conducted. Tests are either completed or in process. These evaluations include: spike holding, corrosion, conductivity, fire resistance, hardness, strength, and efficacy in hardwoods, test charges, with and without borates; develop AWPA Standard requirements for ties of Douglas-fir, hardwoods and pines, commercial usage, Life Cycle Analysis (LCA) and product enhancement through warranties. a Before exposure withdrawal values based upon 30 replicates. One- and two-year exposure values represent means of 15 replicates per treatment. (Values in parentheses show one standard deviation.) b Values differ significantly from creosote ties in the same exposure at α=0.05. The spikes removed from each crosstie for the withdrawal testing were examined for evidence of corrosion. The spikes were measured at the approximate point where the spike emerged from the wood to determine if any cross-sectional loss occurred. The area on the spike where it emerges from the wood is an area where moisture and oxygen levels are optimal for corrosion. In addition, the spikes were cleaned and weighed to determine if weight loss had occurred. After 2 years of exposure spike thickness loss was similar for ACZA and untreated ties; loss for the creosote ties was smaller. Overall, none of the spikes had a significant amount of thickness loss. After 2 years of exposure, weight losses for spikes in all ties were less than 0.5% of their original weight. Weight loss of spikes in ACZA and untreated ties was similar with slightly lower losses for creosote ties. This is the same trend that was seen in the thickness losses. While conductivity effects on poles were included in the 1983 AWPA package for preservative approval, conductivity is also a concern in tie installations due to signaling equipment used by railroads. Several types of tests have been conducted using actual poles, boards and even pellets of the dried preservative. In all tests ACZA treated wood products were found to be equivalent to untreated wood and research showed moisture content was the determining factor in conductivity rather than the preservative types. ACA and ACZA have been used in utility poles for over 50 years with no conductivity issues. A short line in Western Oregon, which has been using ACZA Douglas fir ties for over three years, installed ACZA ties in switch/signaling applications and found no conductivity issues. “We have 6 crossings with approximately 2,400 ties per crossing. All 6 crossings have AC-DC circuits, with no problems to the systems.” - Albany & Eastern R/R. Note the dampness on the ties in the figure below. Chemonite ACZA treated railroad ties are a vast improvement over creosote treated ties in efficacy and are environmentally a better choice. Creosote used in the tie industry has changed since the early 1980’s in that the preservative solution has been cut 50% with oil. Originally creosote came from the coking process and was refracted from the waste product. Creosote is now primarily purchased from China, Mexico, and Europe. Little comes from the United States. Stake tests in the USDA’s Forest Product Laboratory’s, Comparison of Wood Preservatives in Stake Tests (2011 Progress Report) show creosote stake samples started in 1940 are still performing well but none with the diluted creosote preservative or the creosote preservative of today. Creosote contains at least 200 different chemical compounds, most of which are aromatic hydrocarbons. Due to the refraction process many of the most important constituents are bled off for other uses such as naphthalene which is an affective insecticide. ACZA stake tests which have been in place since 1981 and are still doing extremely well with no failures at retentions as low as 0.25 pcf. ACZA crosstie retentions are 0.40 pcf per AREMA. Actually knowing what is in creosote is hard to determine due to the various origins of the coal and constituents that are extracted for other purposes as the previously mentioned naphthalene. Most ties used in the United States are hardwood and treated with creosote to refusal or gage retention instead of ACZA’s exacting penetration and retention standards verified by bore samples and testing per the AWPA Standards. ACZA as a preservative has certain registered constituents which must be contained in the wood and quantified to their percentage and weight based on pounds per cubic foot. Thereby the customer can be assured of what is contained in ACZA preservative treated timber or ties. Handling creosote treated wood has some limitations. In comparison to creosote treated wood which is pungent in smell and can produce chemical burns from handling, ACZA treated wood can be stored, handled and worked like untreated wood. When handling, cutting, or drilling untreated wood persons should use gloves and eye protection. Another difference is in the leachate of both preservatives, creosote is treated with oil which results in an oily residue and all the problematic effects of that versus a highly immobile preservative with little loss of constituents over the life of the treated tie or timber especially in ground contact. ACZA treated wood has been continuously studied for its effectiveness and ability to perform in environmentally harsh conditions. These studies indicate that ACZA treated timbers are fire resistance, resistant to wood pecker damage and carpenter ants. Another study has shown that ACZA treated wood is very resistant to spike with drawl making it desirable for holding spikes and other screw like fasteners. ACZA has been used in the harshest environments and has performed admirably from salt water emersion in docks and piling to commercial cooling tower applications around the world. The effects of fire on wood products has always been a concern in its usage and any effect a preservative system may have on improving fire resistance increases the probability of continued or increase wood product usage. Historical testing done by U.S. Testing Labs and UL gave good indications that ACZA treated wood has fire resistant properties. 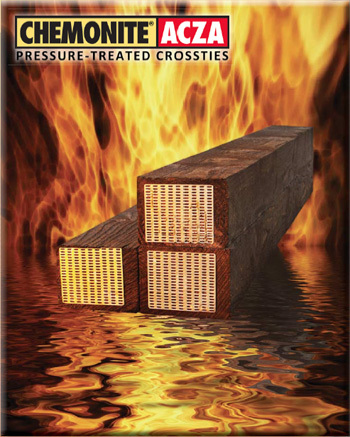 ACZA treated wood is more difficult to ignite than untreated wood and at a retention of 0.35 pcf showed a flame spread rating of 41.7 and smoke development of 115.8 which meets the requirements for a Class B/II fire retardant. Current AWPA minimum retention requirement is 0.40 pcf. for ACZA ties and 0.60 pcf for poles. At retention of 1.86 pcf ACZA treated Douglas fir achieves a Class A/I fire retardant rating with a flame spread of 24.8 and a smoke development of 78.2. Results of these tests are summarized in the table below. Recent in house studies support these earlier results and the ability to include borates further increases fire resistance as shown in the Char Index below. More testing is planned for the near future. Testing of the effects of preservatives on physical properties includes determining their effect on the condition of the wood surface. Timber Products Inspection was retained to perform the ASTM D1037 Janka Ball Test to measure the effect of ACZA treatment on surface hardness. The results of the test are given in. "ASTM D1037 Hardness Test". Timber Products Inspection: Project No. A13-008, 2013. The results indicated there was no meaningful variation between the hardness of treated and untreated hardwood ties. "Compared to untreated, steamed stock, no steaming treatment caused a significant reduction in any bending property evaluated. While there were differences among treatments, no clear trend emerged. When compared to untreated, unsteamed red oak, a drop of 10% or less was noted across all properties evaluated. This is consistent with published data which indicates a 10%, or less, drop in properties after treatment. From a strength and stiffness standpoint, steaming and subsequent treatment of red oak causes no problems and should be fine for treatments requiring steaming before treatment. "Dr. H. M. Barnes, MSU. At ground contact standardized retentions, ACZA demonstrated good control of test fungi. Overall, in weight loss of ACZA blocks performed better than copper napthenate and pentachlorophenol and comparable to creosote. Soil block testing for efficacy of ACZA in hardwoods was done at Oregon State University and reported at the IRG in 1999. Additionally a broad matrix of ties treatments with Chemonite ACZA Ties have been included in the most recent RTA AWPRP Project, the breakdown is below. Full Scale hardwood cylinder charges were treated with ACZA; ACZA + Borates, ACZA + ET and ACZA + Borates + ET. Treatment results of two representative charges are below. 140 pcs. Red Oak Crossties - The ACZA penetration was about the same as treatment with P-2 Creosote. 140 pcs. Mixed Gum Crossties - The ACZA penetration was about the same as treatment with P-2 Creosote. 140 pcs. White Oak Crossties - The ACZA penetration was better than crossties treatment with P-2 Creosote. The penetration was in to the heartwood. - Bill Verbeck of CR Quality Services, Inc. Report issues October 30, 2010. Based on the treating experience, ACZA treated hardwoods were submitted for and received approval for inclusion in the AWPA Book of Standards. Below are the treating requirements for the approved species for ties currently listed in the AWPA Book of Standards. ACZA preservative is listed in Standard P-22 and treated wood products are listed in the American Wood Protection Association (AWPA) Standard U1, Commodity Specification C T1 Section C.
Whenever "or" is specified, it shall be interpreted to mean whichever is less. Whenever "and" is specified, it shall be interpreted to mean whichever is greater. Red Oak penetration must average a minimum 65% on twenty 3.0” cores. ACZA White Oak must also have a minimum heartwood penetration of 33% in twenty 1.5" cores. Incising is required for Cypress, Coastal Douglas-fir, Western Hemlock, Western Larch, Intermountain Douglas-fir, Jack Pine, Lodge Pole Pine and Red Pine. Incising is optional for Oak and Hickory, Mixed Hardwoods, Southern Pine and Ponderosa Pine. The seven charges of treated hardwood ties were returned to the east coast for installation. Most were installed in SW Florida, SE Georgia and Eastern North Carolina. The North Carolina site is a Hazard Zone 4 exposure, the Georgia site is a Hazard Zone 5 exposure site and the SW Florida site is a Hazard Zone 5+ exposure where the life expectancy of creosote treated hardwood ties has been 7 years. Effective 2013, Mississippi State University will provide evaluation service for these ties. The Original Douglas-fir Ties were visually observed after three years of exposure in Western Oregon. The Railroad was pleased with the results to date. Materials are being evaluated on their environmental footprint. ACZA treated wood has been no different. As a part of the ongoing evaluation of ACZA and its stewardship of the environment, AqueTer was contracted to perform a Life Cycle Analysis (LCA) in comparison with alternative products for its main uses. For ties the comparison was with concrete and plastic/composite ties. As indicated in the table: ACZA tie production and usage has less impact on Green House Gases (GHG), fossil fuel use, acid rain contribution, smog contribution, eutrophication and ecological toxicity over their entire life span from raw material to disposal. Limited product warranties are now in place for hardwood ties, Douglas-fir ties and Southern Pine ties and timbers. Go to www.chemonite.com for more information. AZCA has protected wood for 25 years from wood destroying organisms without undue effect on the properties of the wood it is protecting including strength, corrosion and conductivity. It can treat refractory species and performs well in the harshest of environments - salt water exposure and is leach resistant, offers fire protection, and good fastener holding characteristics. Being able to blend borates into the treating solution only improves ACZA against wood destroying organisms, fire and corrosion. Product enhancements can be used to improve surface characteristics. These abilities, characteristics, properties and uses make ACZA a versatile wood preservative system. Download ACZA/BORATE limited warranty .